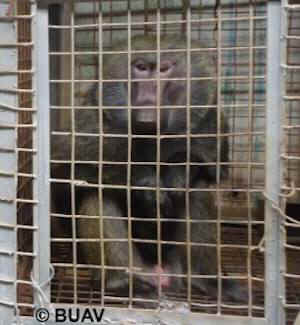 The BUAV has launched its latest investigation Captive Cruelty, which reveals the terrible suffering inflicted on the wild baboons of Kenya; from their cruel capture in the wild to their imprisonment and use in research at the Institute of Primate Research (IPR) in Nairobi. Kept in unacceptable conditions, that seriously compromise their welfare and breach international guidelines, the baboons are subjected to disturbing experiments, involving researchers from countries including the UK and USA. Legislation in Kenya relating to animal experiments is outdated and hopelessly inadequate. Captive Cruelty reveals the harrowing and pitiful conditions in which wild baboons were held at IPR. Many were housed on their own in small, barren metal cages. Some individuals suffered this solitary confinement for years, resulting in disturbed abnormal behaviour such as circling. In the UK, using wild-caught primates in research was banned in 1995, yet researchers from Newcastle University are bypassing UK law and, with public funding, going to Kenya to carry out disturbing and invasive experiments on wild-caught baboons. This is also a breach of recent guidance by UK funding bodies which requires UK researchers to maintain UK welfare standards when carrying out experiments abroad.